Late 40’s/early 50’s Mercier Meca Dural, as originally acquired – with incorrect 700c wheel size and various missing parts. 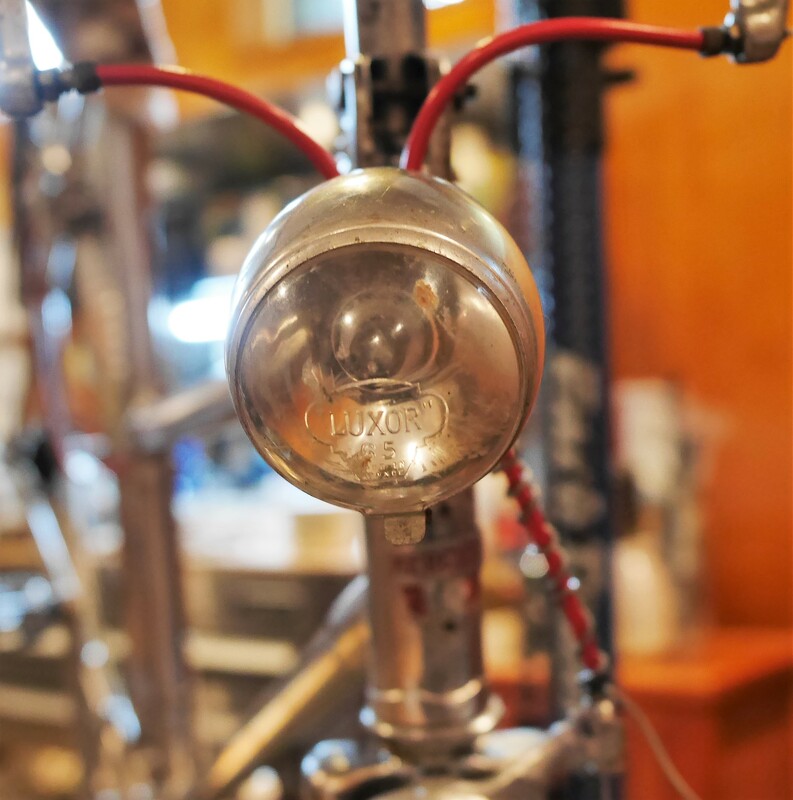 To counteract the too frequent headaches and setbacks on the mechanical side of bringing this Mercier Meca Dural back to life, I decided to focus on the “extras” that are often regarded as nonessential accessories – chain guards, lighting, and racks. As fashion experts know, it’s the extras that really make one’s ensemble come together. 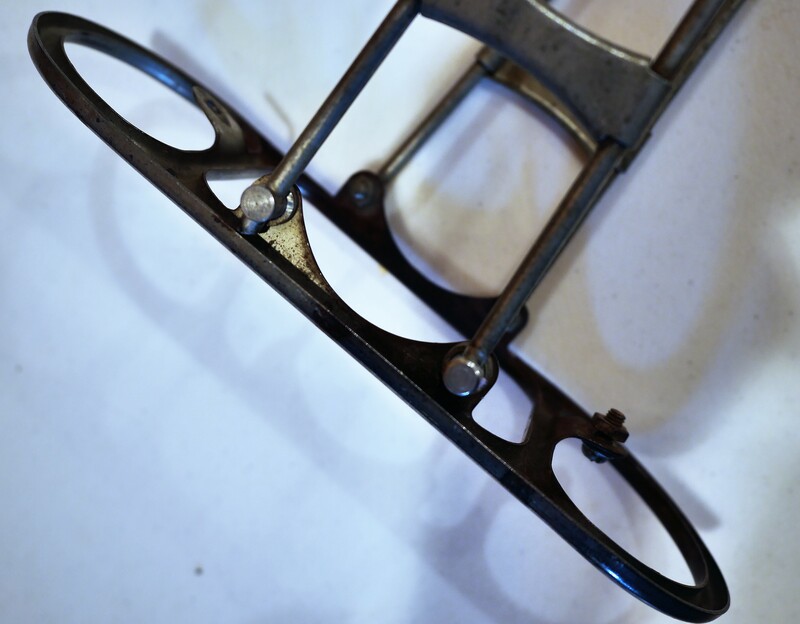 Mounting a chain guard, however, proved daunting. 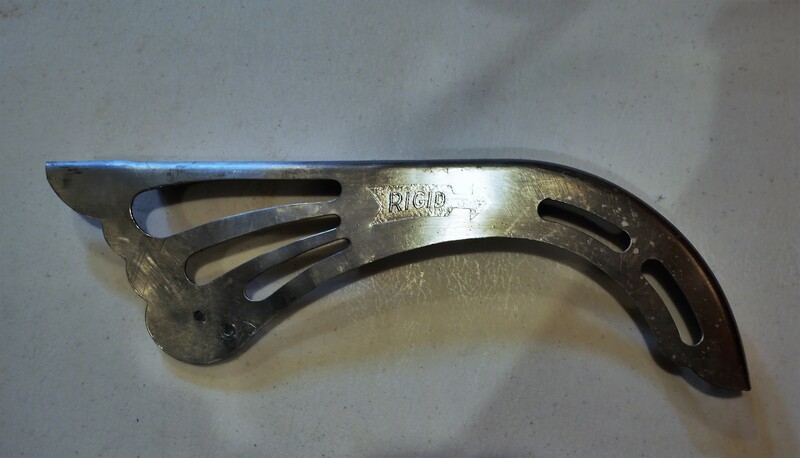 I had a nice aluminum Rigid-branded guard from this same era, which fit well around the 46T Louis Verot chain ring. But, one of the odd things about this bike is that all the frame mounted braze-ons and brackets are missing. 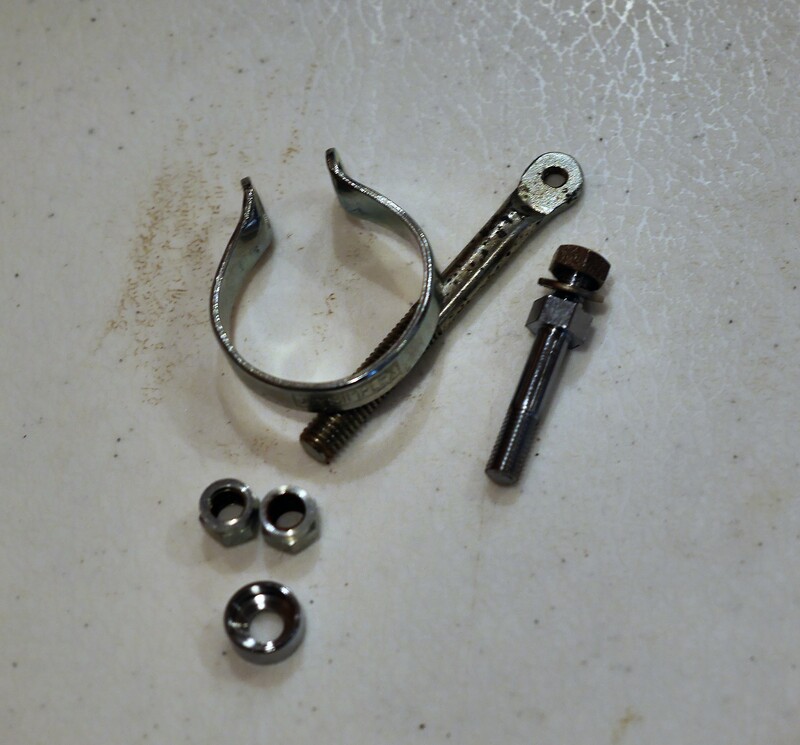 I had this chain guard hardware set, shown above, that included a baffling assemblage of clamps, threaded bolts, and numerous nuts and washers, but I couldn’t determine how to make this hardware work on this bike and with the Rigid-branded chain guard. 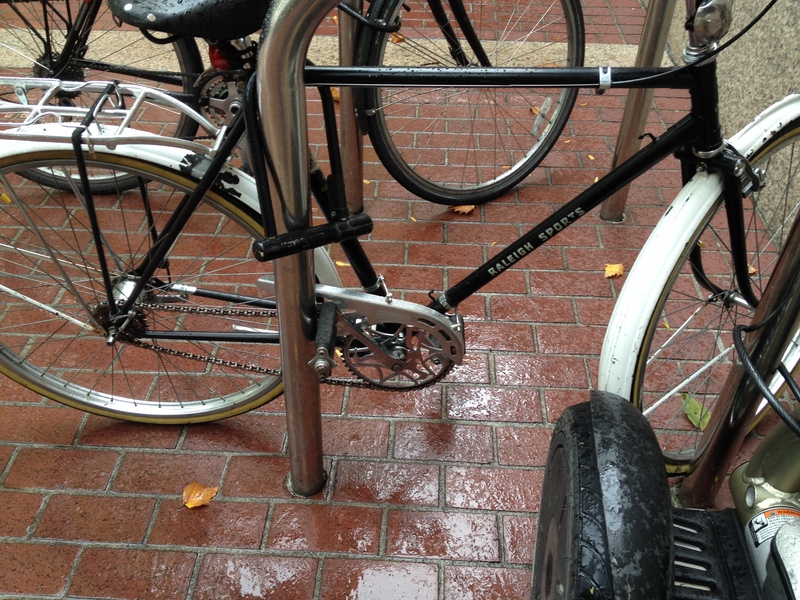 Creative chain guard mount – spotted in downtown Portland. Fortunately, while downtown waiting to catch a train a while back, I spotted this wonderful Raleigh Sports with an interesting chain guard mounting solution. I snapped this photo with my iPhone so that I wouldn’t forget what I saw. Meanwhile, I searched the internet for chain guard mounting lore. 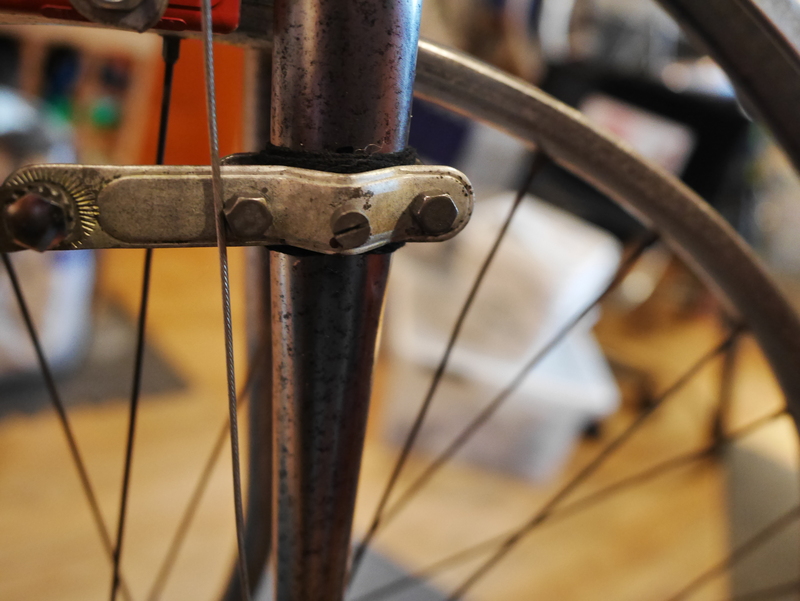 Velo-Orange came to the rescue, with a nice discussion of different kinds of frame braze-ons for chain guard mounts, as well as how to configure hardware when your frame lacks such mounts. 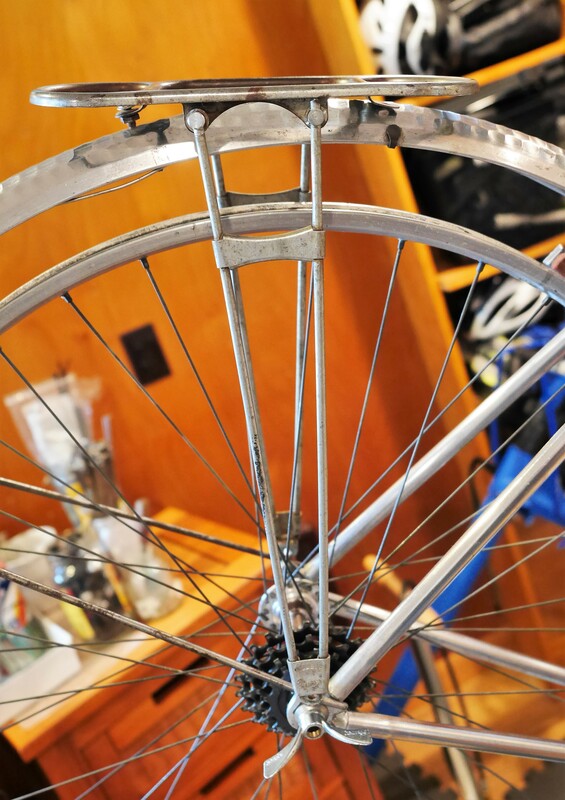 You’ll note in the photo above that this cyclist has mounted the chain guard using eyebolts on the guard, which make it easy to adjust the chain guard when used with the long threaded bolts – with the threaded portion attaching the the frame clamp. Using these ideas, I anticipate that I’ll get the Rigid chain guard mounted properly, but I can see that I’ll need a bit more in the way of hardware. Creases at back of lamp to hold cables in place. Very pretty branded Luxor stem clamp. Moving on to this bike’s lighting system, I re-installed the front Luxor 65 headlamp back on to its Luxor branded stem mounting bracket. Luxor lighting is very well thought of, and there is even one enthusiast who loves Luxor 65 so much that the cyclist machined a copper heat sink for their beloved Luxor light so that LED’s could be used with this system. I don’t plan to go that far, but I am impressed with the quality of this light. When I was setting it up, I noticed creases at the back of the headlight shell that I thought were caused by the shell being dropped and dented. 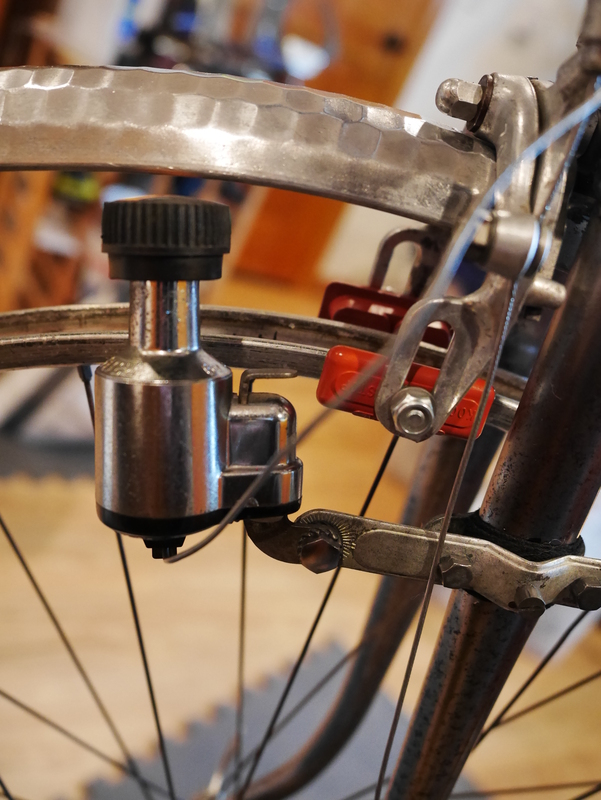 But once I had the light mounted, I could see that the creases were in the perfect position to hold the front brake cables in place. I don’t know if these dents were a fortunate mishap – but it works for me. You’ll note that I used red cable housing for this build. 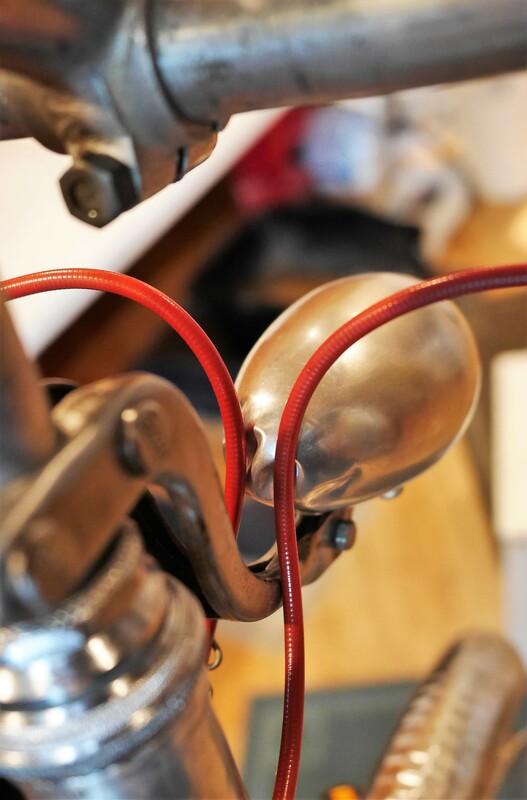 These housings are vintage from the 1970’s – they are a darker red than the new red Jaguar cables, and match the dark red color in the Mercier head badge. Hopefully, the fashion police will agree with my choice. 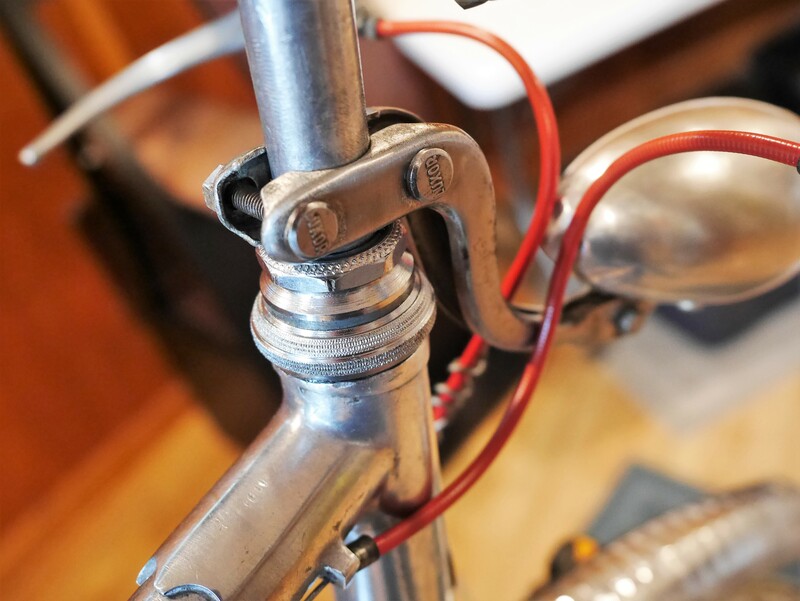 Installing the lighting meant coming up with a fork mounted dynamo, which this bike would have originally had (as there is no dynamo mount on the seat stays). I located a vintage dynamo fork bracket, and installed it on the fork blade over some black cloth handlebar tape, to protect the steel fork. For now, I have set up this very lightweight and free spinning Soubitez Argil dynamo, which is not from this era, but dates probably to the 1960’s. If it works well, I’ll keep it. If not, I’ll source a dynamo from this era. You’ll see that the fork bracket includes a grounding set screw in the middle of the bracket. This provides the electrical ground for this system, so it needs to contact the steel fork. But, you don’t want to screw it in too far, as it could damage the fork. Finally came the ideas for a rear rack. 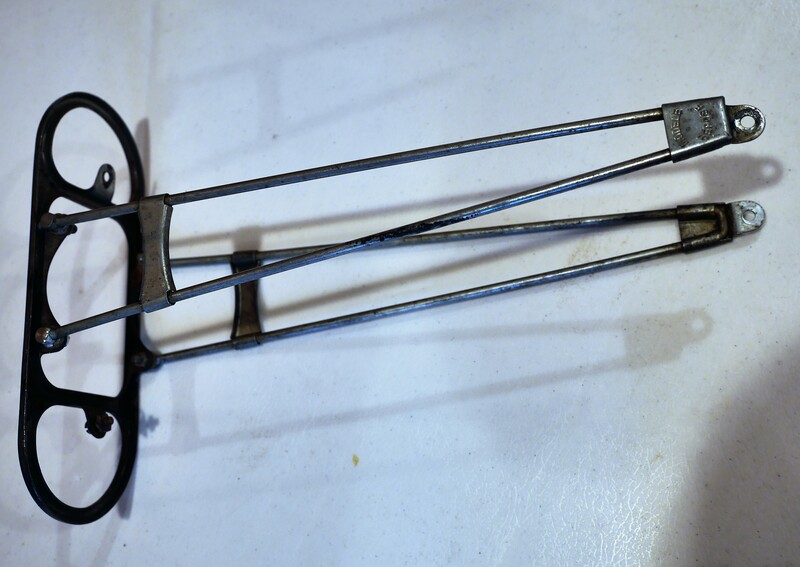 I have had this interesting 1940’s steel rack in my shop for awhile. I haven’t found the right project for it. I dry mounted the rack on the bike and found that it seemed to fit well. This steel rack is reasonably light weight and features fully adjustable stays, so that it should fit on pretty much any configuration. It is a bit rusted and needs to be cleaned and polished. 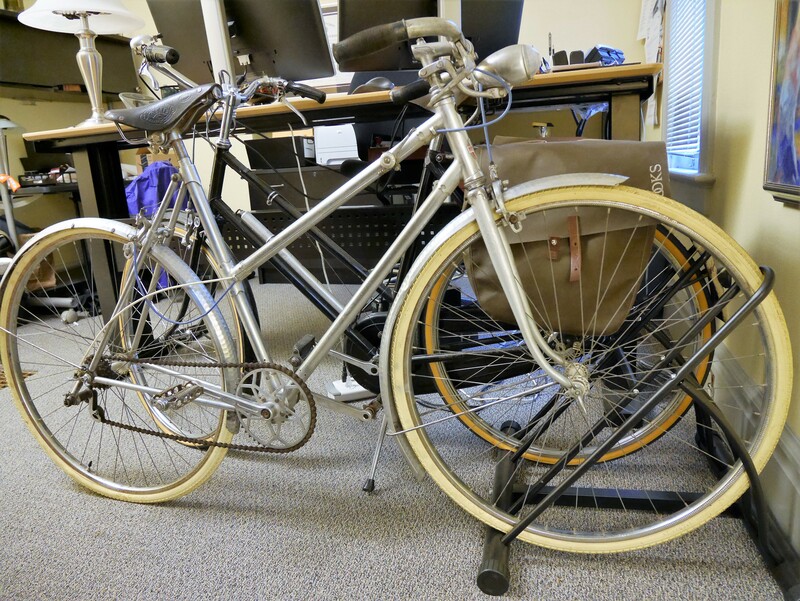 It’s not the strongest rack out there, but should work well for this bicycle, which was designed for city riding. One of the fun things about this Mercier Meca Dural, is that it served as the inspiration for Public Bike’s Champs-Elyisees d8i bicycle. The above photo provided their inspiration. When I have completed the restoration of my Mercier Meca Dural, I hope to be equally inspired, and inspiring. 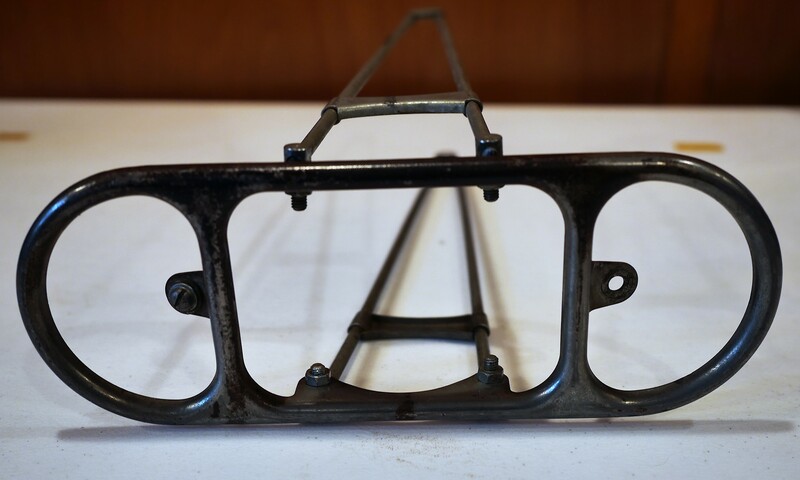 This entry was posted in 650B, Bicycle restoration, French bicycle, Ladies Vintage Bicycle, Meca Dural, Mercier, Mixte, Racks, town bike, Vintage bicycle restoration, Vintage French Bicycle and tagged 650b, aluminum fenders, chain guard mount, French bicycle, hammered fenders, Luxor 65, Meca Dural, Mercier, rear rack, Rigid chain guard by Nola Wilken. Bookmark the permalink. That’s a really great rear rack you found for that. I actually looked around for a bit to see if I could help you with finding a chain guard. That’s a nice, sporty one you have. These guys have a lot of rare, small bits: http://www.velo-classic.de. I’m not sure what you need for mounting hardware. The red housings look good (you definitely benefit from the touch of primary color). Thanks, Paul. One reason I like the Rigid chain guard is that the arrow in the design matches the arrow on the Dural Azul stem. These bikes seemed to have a variety of chain guards on them – from staid and minimalist to large and flashy. I like the red housings, too. It will be fun to see how the bike looks once all built up. Thanks, Don. Same to you!